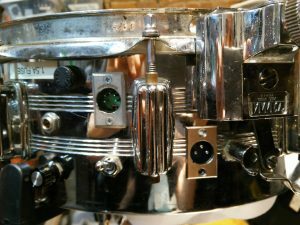 A custom microphone installation into Michael Evans’ amplified snare drum. 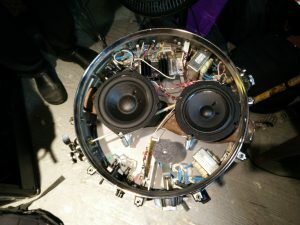 The microphone can be fed back into the internal speakers through the resonating skins and combined with contact microphones for a wide range of sounds that can be manually manipulated. This entry was posted in Uncategorized and tagged acoustic, analog, hardware, percussion on Apr-2016 by bilbowen. This is a pedal that I made to control the motor speed of the fans in a vibraphone. 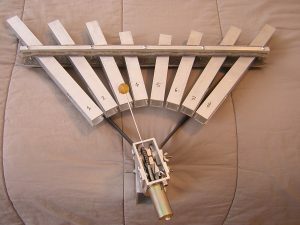 It’s designed to fit any Musser frame’s motor and pivots side-to-side so that the player’s full weight is supported, leaving the other foot to press the sustain pedal. The fans move slower when turned to the left, faster to the right, freeing both hands to play as the vibrato is increased or decreased. This entry was posted in Uncategorized and tagged acoustic, hardware, percussion on Oct-2013 by bilbowen. After trying and trying to come up with a bow wheel that could maintain effective friction on a surface while isolating the noise of the motor and mechanics from the acoustic resonating chamber, I decided to investigate making an electromagnetic bowing device, like the E-bow. Pictured above is the prototype for such a device. A physical oscillator. There are two coils around AlNiCo (Aluminum Nickel Cobalt alloy) magnetic poles, one a pickup and the other a driver. These are wired to the input and output of an audio amplifier IC and fed back into one another through the spring steel tongue (pictured here with a piezo element under it’s bridge terminating at the 1/4” jack). A digital potentiometer regulates the amount of voltage driving the circuit for dynamic control. Staccato articulation can be achieved by instantly reversing the electrical polarity of the driver to stop the vibration. The gain of the audio amplifier goes quite high, all the way to the 12V rail supplying it and reads as a square wave on a scope even at low gain settings. Because the steel tongue, like a speaker cone in a back-feeding guitar amplifier, is physically unable to jump to the +/- DC poles and has to ‘slide’ to them, a near-perfect sine wave results. 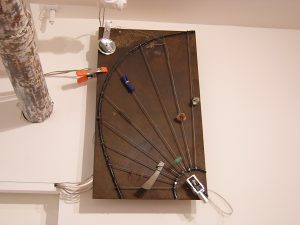 This entry was posted in Uncategorized and tagged acoustic, analog, hardware, pcb on Oct-2005 by bilbowen. Miniature, modular instruments designed to affix to virtually any structure thereby allow the composer musical control of anything from a battery of specially designed instruments to structural surfaces within pre-existing architectural space. With an emphasis on simplicity, each of these mechanisms’ design usually consists of only one electromechanical actuator (a rotary motor, or linear solenoid) which responds to varying degrees of supply voltage remotely regulated by a microcontroller. This single-actuator design philosophy demands that all mechanical movement within the instrument be subordinated on the physical capabilities of the lone motor or solenoid employed and, while this may sound like a limitation, such use of mechanical design (as opposed to more ‘intelligent’ electronic design) manifests a reliability, mechanical consistency and modularity that would otherwise not be possible. Each device can be fitted with a variety of harnesses for mounting and is connected to the brain (box containing the PIC microcontroller and DC power supply) via a single run of cable. Thus, the microcontroller administers the appropriate voltage to hit, shake, scrape, bow, spin, whip, or pluck sound from any sonorous object with the exact precision one would expect from digital control. Installations and Performances in New York City (Harvestworks, Chelsea Art Museum, Gigantic Art Space, Eyebeam Gallery, Angel Orensanz Foundation, P.S.1 Clocktower Gallery, and The Frying Pan), and worldwide at 2004 NIME conference in Hamamatsu, Japan, 2004; iMAL festival in Brussels, Belgium; 2004 Audio Arts Festival in Krakow, Poland; When The Time Traveller Kills His Grandmother (a survey of current sound art curated by Fritz Welch) 2005 London, England. 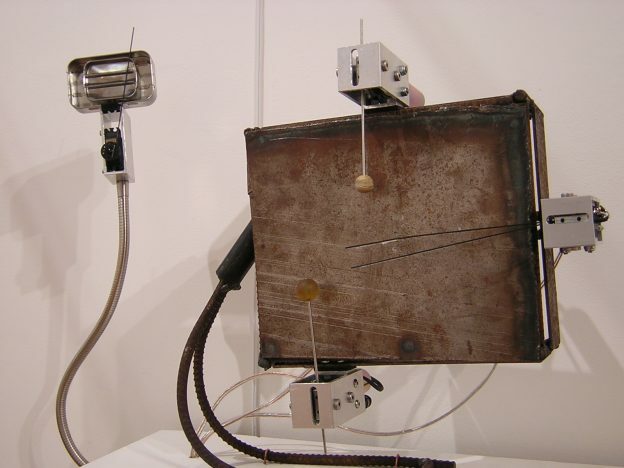 This entry was posted in Uncategorized and tagged acoustic, C, firmware, hardware, max-msp, pcb, percussion, pic, robotics, sculpture, software on Oct-2002 by bilbowen.